Stan Musial and Earl Weaver played together as starters in Cardinals spring training games. Both were elected to the National Baseball Hall of Fame _ Musial for his accomplishments as a Cardinals player and Weaver for his success as an Orioles manager. Musial, 92, and Weaver, 82, died on the same day, Jan. 19, 2013. In March 1952, Musial, 31, was in his prime, having led the National League in batting average, triples and runs scored in 1951. Weaver, 21, was in the Cardinals’ major-league camp for the first and only time. The 5-foot-7 second baseman was the youngest and shortest member of the Cardinals’ 40-man roster in March 1952, The Sporting News reported. A St. Louis native, Weaver signed with the Cardinals at 17 in February 1948, a month after he was graduated from Beaumont High School. He played for the Woltman Jewelers team that won the St. Louis Intermediate Municipal League championship three times and also for the Fred W. Stockham American Legion team that won Missouri state titles in 1945 and 1947, The Sporting News reported. In his first four seasons (1948-51) in the Cardinals’ farm system, Weaver played on four teams that won league championships: West Frankfort (Illinois State) in 1948, St. Joseph (Western Association) in 1949, Winston-Salem (Carolina) in 1950 and Omaha (Western League) in 1951. 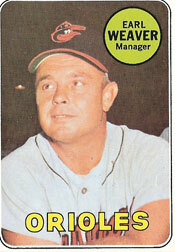 Weaver’s manager at Winston-Salem and at Omaha was George Kissell. When Winston-Salem clinched the 1950 Carolina League title with a 3-1 victory over Burlington in Game 5 of the best-of-seven series, pitcher Vinegar Bend Mizell hit a home run and Weaver drove in the deciding runs with a bases-loaded single in the sixth inning. “Scouts of the parent St. Louis Cardinals describe Weaver as a Solly Hemus type,” The Sporting News declared, comparing Weaver with the Cardinals’ feisty shortstop. After being named to the 1951 Western League all-star team along with Omaha teammate Ken Boyer, Weaver entered 1952 determined to win a spot on the Cardinals’ Opening Day roster as a backup to second baseman Red Schoendienst. When the Cardinals opened their 1952 spring training schedule on March 8 against the Yankees at St. Petersburg, Fla., the top three in their batting order were Weaver at second base, Hemus at shortstop and Musial in left field. Weaver had two hits and Musial had one in the Yankees’ 11-5 victory over the Cardinals. The next day, March 9, 1952, Weaver again batted leadoff and started at second base and Musial was in left field, batting third. Weaver and Musial went hitless, but the Cardinals beat the Yankees, 3-1. What made that game remarkable is 10 of the players _ three Cardinals and seven Yankees _ became major-league managers. They were Weaver, Hemus and catcher Del Rice of the Cardinals; catchers Yogi Berra and Ralph Houk, shortstops Jerry Coleman and Gene Mauch, second baseman Billy Martin, pitcher Eddie Lopat and right fielder Hank Bauer of the Yankees. _ On March 10, batting leadoff and playing second base, Weaver was 2-for-4 with two RBI in the Cardinals’ 8-5 victory over the Braves at Bradenton, Fla. Musial had a double in two at-bats. _ On March 13, Weaver was 2-for-4 with a stolen base and Musial was 1-for-4 in the Reds’ 2-1 victory over the Cardinals at St. Petersburg. _ On March 14, Weaver had two hits, including a home run off Bob Porterfield, when the Cardinals and Senators played to a 6-6 tie in a game called in the sixth inning because of rain at St. Petersburg. _ On March 19, Weaver contributed a pinch-hit single for the Cardinals in a game won by the Red Sox, 3-2, at St. Petersburg. The starting left fielders were Musial and Ted Williams. Musial was 2-for-3; Williams, 0-for-3. Though he impressed the Cardinals, Weaver was returned to the minor leagues at the end of spring training. Weaver played two more seasons in the Cardinals’ system before his contract was purchased by Denver, a minor-league affiliate of the Pirates, in September 1953. Weaver played 14 seasons in the minor leagues without appearing in a major-league game. He established himself as big-league caliber as Orioles manager by winning 1,480 regular-season games, six division titles, four American League pennants and a World Series championship in 17 seasons. Few recalled, though, his professional baseball career began as a Cardinals prospect who joined Musial as a regular for one glorious month in spring training.